Continuing on with this culinary journey of recently maligned countries, today it’s Africa, specifically Senegal. When I was a kid I had a cookbook that featured the customs, a brief history and a recipe from various countries. It’s where I learned that cashews grow on trees and the nut grows off the bottom of the fruit, the cashew apple, in a very hard shell. Each apple has one cashew nut, or seed. Though I don’t remember the featured country – Brazil? India? – I figured out pretty quick why cashews were so expensive. That little nugget of information has absolutely nothing to do with this post except that there was another page in the book that was very interesting. 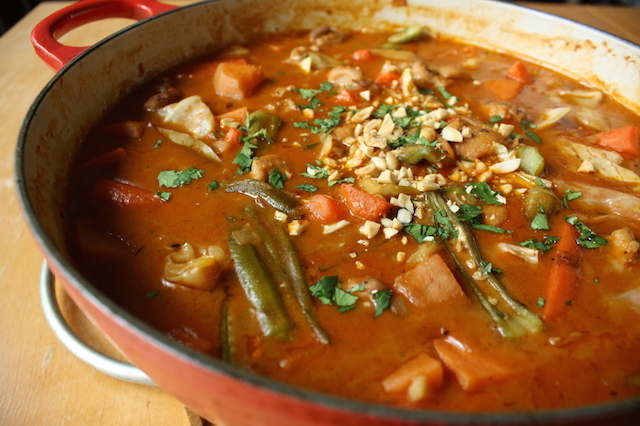 It was a recipe for an African “groundnut stew” and contained peanut butter, which blew my 8 year old mind. My entire frame of reference for peanut butter at that time was a sandwich, on smooshy bread with grape jelly and yet here it was in a stew. For dinner. What? I’ve been intrigued ever since. Yet here I am a zillion years later and I’ve never made this. Why? I have no idea. The thought of peanut butter in a soup or stew isn’t so crazy anymore. I’ve worked peanut butter into sate sauces, slicked noodles with it, made marinates and once, when I’d run out of tahini, made hummus (not bad.) 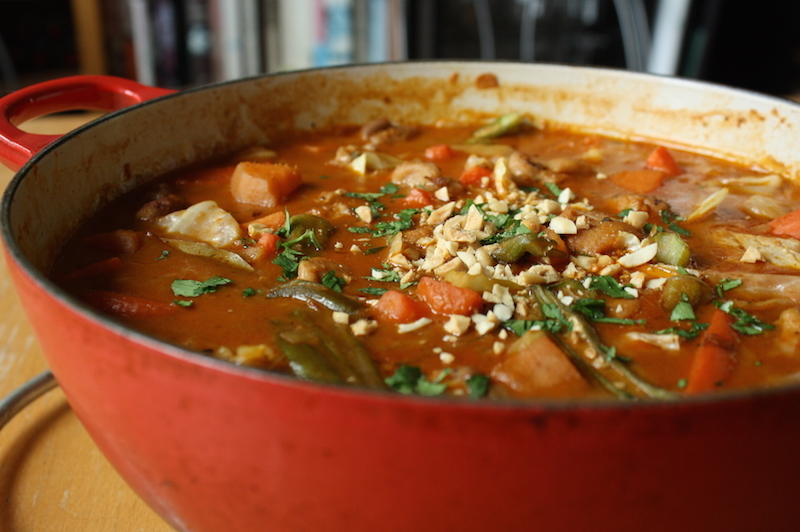 Yet I’d never made the classic Senegalese groundnut stew. When I started this exploration, it was one of the first things that came to mind. Game on. I wish I could find that cookbook of my childhood. I scanned my mom’s bookshelves when I was home for Christmas but I fear it’s long since made the trip to Goodwill. Strike one. Then I ordered a highly praised Senegalese cookbook but a damn thief intercepted the delivery last week. Strike two. But I wasn’t going to let a few annoyances hold me back. Impatient and not wanting to wait for the replacement book to arrive, I went to the internet where everything really starts anyway. My first stop was a favorite source that has served me well in this project, the African recipe guide of Saveur magazine. 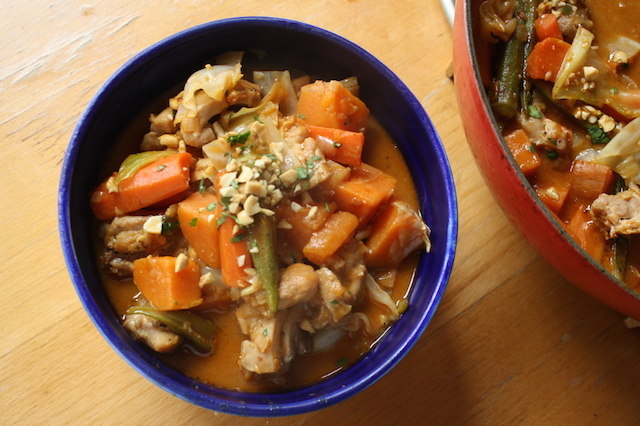 Using their Peanut Chicken Stew recipe as a guideline, I clicked around, looked at a lot of posts and ultimately came back. It seemed as good a place to start as any. I liked that while it contained chicken, it was also vegetable heavy – carrots, cabbage, okra, sweet potatoes. The sauce is built slowly with onions, garlic, tomato paste, habanero for some nice heat, bay leaves and yes, peanut butter. The particular recipe I started with claimed Senegal as its home team but this dish is found all over West Africa. I didn’t know what to expect but in my mind, I was thinking it might sort of be like the peanut sauce served with Asian sates, the grilled skewers of meat. Absolutely not – it was 100 times better. The heat was perfect, just enough to feel it but not enough to be uncomfortable. The chicken was tender and the sauce was deeply flavorful with a slight background hint of earthy peanuttyness. It was fantastic. With rice to sop up the delicious sauce, I couldn’t stop eating. Score one for the peanut. STRESS THERAPY BAKING FACTOR: DEEP FLAVORFUL GOODNESS. I can totally see this becoming a new comfort food in my world. It has that richness of a sauce that’s been enriched with cream, yet is dairy free and wonderfully flavorful. There’s a great thing that happens with rice that a good Thai curry will do, where the grains sort of soak up the flavors and somehow make everything taste better. I have a soft spot for those kind of dishes. The stew is unusual in that it pushes us out of our familiarity but isn’t too far of a stretch that it seems weird or odd. And it’s interesting to make – how often do you use peanut butter in a savory dish? Now, would I have eaten this as an 8 year old? It pains me to say it, but probably not. Kids are weird like that. Thankfully those days are long past and I’m already thinking of when I can make this again and how well it might freeze for later meals (pretty well I would think.). The original recipe recommends serving this with the traditional accompaniment – fonio, a type of millet. I served the stew with rice but I could totally get behind a small grain like millet or even couscous to soak up the delicious juices. Brown the chicken: Heat oil in a 6–qt. Dutch oven over medium-high heat. Season chicken with salt and pepper, and add to pot; cook in batches, turning once, until golden brown. Transfer chicken to a plate, and set aside. 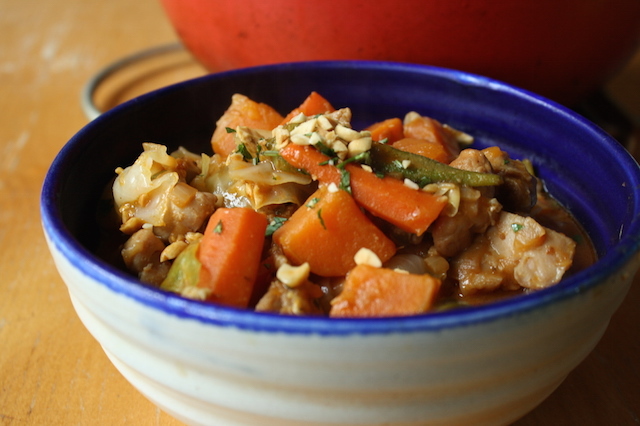 Make the stew: Add the onion to the pot, and cook, stirring, until soft, about 6 minutes. Add tomato paste, and cook, stirring often, until lightly caramelized, about 2 minutes. Add the peanut butter, habanero, and bay leaf and cook, stirring, until lightly toasted, about 4 minutes. Add the chicken stock, stirring until smooth. Add the reserved chicken, carrots, okra, sweet potatoes, and cabbage. Bring to a boil. Reduce heat to low, and cook, covered partially and stirring occasionally, until chicken and vegetables are tender, about 20-25 minutes. Taste the sauce and season with additional salt, pepper and lime juice if needed. Serve hot in shallow bowls with rice. This sounds very good, and with lots of ingredients that are usually on hand I think I’ll be making this soon.